By the time George Eliot began work on Scenes of Clerical Life late in 1856, she already had in mind a pretty clear idea of what a novel ought to be. Here her work for the Westminster Review and the Leader had been of great assistance, for it had enabled her to assess many contemporary novels as well as numerous works of historical, sociological, philosophical and topical interest. The 'theory' of the novel that resulted was not as comprehensive or integrated as the historic one formalised in Henry James's Prefaces fifty years later, and it clearly underwent alteration as George Eliot the novelist matured; nevertheless, these early writings remain a valuable and generally reliable guide not only to her conception of the novel, but to some of the aesthetic problems which beset her art and thought more generally. 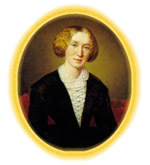 Many of the most important statements are well-known and have been collected in Thomas Pinney's Essays of George Eliot (1963), hereafter given as Essays. Others occur in the novels themselves or are to be found in G. S. Haight's edition of The George Eliot Letters 0954-1978), here abbreviated as Letters. At the heart of George Eliot's conception of the novel lies a belief in the social efficacy and necessity of truth in art. She praises Ruskin's 'doctrine that all truth and beauty are to be attained by a humble and faithful study of nature' (Essays, p. 266) and gives several reasons in support of it. One is simply that ‘nature', especially in its human manifestations, possesses an intrinsic value that warrants reverence.